Hartford is the largest metropolitan area in Connecticut, according to Census results from 2010. The area is home to many insurance companies' headquarters, and insurance is most certainly the area's primary industry. 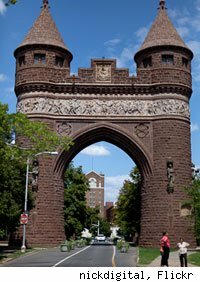 Hartford is one of the oldest cities in the United States at nearly 400 years old. The unemployment rate of the Hartford area was 8.9% according to April 2011 statistics from the Bureau of Labor Statistics, April 2011 report. State of Connecticut – State government jobs are always popular. According to the MetroHartford Alliance, they are the leading source of employment in Connecticut's capital. United Technologies Corp. – Currently ranked 44th on the Fortune 100, United Technologies is a leader in research and development for numerous high-technology fields. They own six companies under the United Technologies name, each with a different specialty. Hartford HealthCare – Hartford HealthCare is the Hartford area's leading provider of health care systems. They own two hospitals in the area, as well as a tertiary care teaching hospital and smaller facilities. The Hartford Financial Services Group – Also known simply as The Hartford, the Hartford Financial Services Group is a Fortune 200 company. They are one of America's largest of investment services and insurance. Additionally, they hold operations in Japan, the United Kingdom, Canada and Ireland. University of Connecticut – Repeatedly ranked as the top public university in New England, University of Connecticut is comprised of nearly 30,000 students across six campuses. The Greater Hartford campus is home to roughly 2,000 undergraduate and 600 graduate students. Aetna, Inc. – Aetna is a large health insurance company, aimed at consumers and ranked 77th on the Fortune 100. Their new Aetna HealthFund line of insurance products has proven popular and includes HSA, HRA and RRA options. The Travelers Cos. Inc. – With over 30,000 employees and 13,000 independent agents, Travelers Insurance is the largest insurance corporation based on market value. Based out of Hartford, Conn., they are ranked at 106 on the Fortune 200. Bank of America - Bank of America is the largest bank holding company in the United States by assets, and the fifth-largest company in the U.S. by total revenue. As of August 2009, they hold 12.2% of all U.S. deposits. Saint Francis Hospital & Medical Center – Established in 1897, Saint Francis was the first Catholic hospital on record to collaborate with a Jewish hospital (Mount Sinai Hospital). They have concentrations in cardiology, oncology, orthopedics, women's services and rehabilitation. ESPN – Launched in 1979, the Entertainment Sports Programming Network (ESPN) broadcasts primarily out of Bristol, Connecticut. They have other satellite offices around the country as well. Their popular show, Sports Center, premiered with the network's debut and has lasted through the present day. Hartford area work from home opportunities decreased 93% since October 2009. Hartford area consulting opportunities decreased 89% since October 2009. Hartford area outsourcing opportunities decreased 68% since October 2009. Hartford, CT is projected to grow by 4.5% through 2018. As the economy continues to recover, Hartford's strong base of health care, education and customer service jobs should grow.